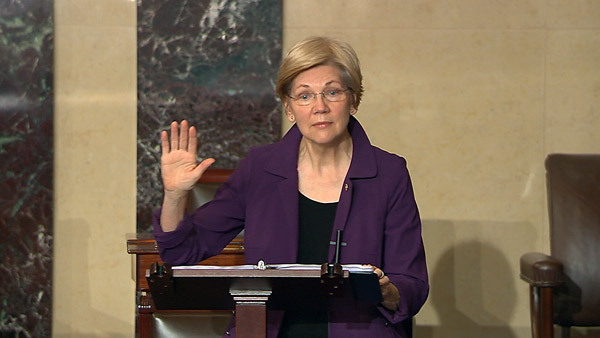 WASHINGTON -- Senate Republicans silenced Democratic Sen. Elizabeth Warren for criticizing colleague and Attorney General-designate Jeff Sessions with the words of Coretta Scott King from three decades ago. Warren, whose name has been prominent in speculation about the 2020 presidential race, was given a rare Senate rebuke Tuesday night for impugning a fellow senator and she was barred from saying anything more on the Senate floor about Sessions, R-Ala. The Senate has been working around the clock since Monday as Democrats challenge President Donald Trump's nominees, although Democrats lack the votes to derail the picks. Despite the rebuke of Warren, D-Mass., other Senate Democrats quoted King in speeches on Wednesday morning. Democrats are portraying Sessions as a threat to civil rights, voting rights and immigration. Republicans have defended Trump's choice to be the top law enforcement officer as a man of integrity who will be an independent voice in the new administration. A vote on Sessions was expected Wednesday evening. The incident underscored that the partisan divide in the Senate has devolved into nearly unchecked rancor, with majority Republicans muscling through Cabinet nominees in committee by changing the rules. Democrats are under intense pressure from their liberal base to challenge the entire Trump agenda, especially his nominees. Warren produced a three-decade-old letter in which Mrs. King wrote that Sessions, as an acting federal prosecutor in Alabama, used his power to "chill the free exercise of the vote by black citizens." In the 1986 letter, Martin Luther King Jr.'s widow said Sessions' actions as a federal prosecutor were "reprehensible" and that he used his office "in a shabby attempt to intimidate and frighten elderly black voters." "Mr. Sessions has used the awesome power of his office to chill the free exercise of the vote by black citizens in the district he now seeks to serve as a federal judge," Mrs. King wrote. Mrs. King died in 2006. Quoting King technically put Warren in violation of an arcane Senate rule for "impugning the motives" of Sessions, though senators have said far worse. And Warren was reading from a letter that was written 10 years before Sessions was even elected to the Senate. Still, Senate Majority Leader Mitch McConnell, R-Ky., invoked Senate Rule 19, which says "a senator in debate, who, in the opinion of the presiding officer, refers offensively to any state of the union, or who impugns the motives or integrity of any senator, or reflects on other senators, may be called to order under Rule XIX." The Senate voted 49-43 along party lines to sustain the decision to rebuke Warren. Warren argued: "I'm reading a letter from Coretta Scott King to the Judiciary Committee from 1986 that was admitted into the record. I'm simply reading what she wrote about what the nomination of Jeff Sessions to be a federal court judge meant and what it would mean in history for her." Warren was originally warned after reading from a statement by the late Sen. Edward Kennedy, D-Mass., that labeled Sessions a disgrace. Democrats pointed out that McConnell didn't object when Sen. Ted Cruz, R-Texas, called him a liar in a 2015 dustup.